I’ve had this recipe in draft mode for months because I can’t seem to get a picture that makes it look as appealing as it truly is. So now I’m going to be okay with the photo, and just let you know that it’s so good – it’s vegan comfort food. Paneer is a fresh cheese you can make at home with milk and lemon – the silken tofu does a great job of representing the creamy, almost melty texture of paneer. Tofu will also satisfy your umami cravings – umami is known as the fifth or savoury taste, which is often satisfied by meat. Tofu also contains the compounds that the taste buds register to satisfy the savoury cravings. Maybe that’s why this one seems like comfort food to me. 1. This is great served on Brown Basmati Coconut Rice, so you’ll want to start that first. White rice won’t take as long, so if you’re using that you don’t need to start it yet. 2. Put onions, garlic, chillies and ginger in food processor or blender. Process until smooth. You may need to add a little water. 3. Heat 2 tablespoons of the oil/butter in a large frying pan, then cook the spices on medium heat until fragrant. Add the other 3 tablespoons of oil/butter and the onion paste, cooking for about 10 minutes. 4. Cook the spinach until wilted and add to the food processor along with the cornstarch and puree it. Add the spinach, along with about 1/2 teaspoon of salt, to the paste. Bring it to a boil and cook for about two minutes. At this time have a taste and see if it needs more salt; it probably will. 6. 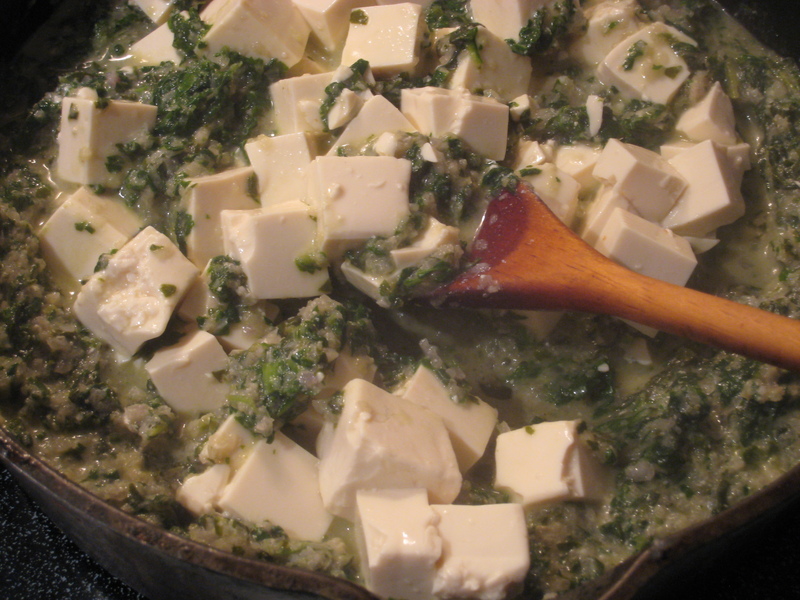 Cut the tofu into squares and add it to the pan to heat it. 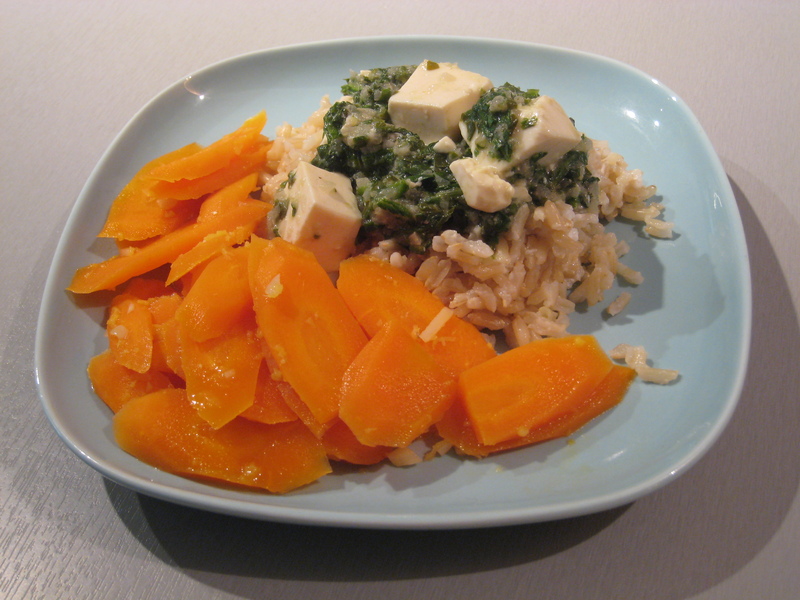 Once it is hot, stir in the yogurt carefully so the tofu doesn’t break too much, and serve right away. I enjoy this one for leftovers too! You can substitute the spinach with swiss chard if you like.